Graduate and multicultural student organizations both earned a greater share of the Student Association’s funding for next academic year. 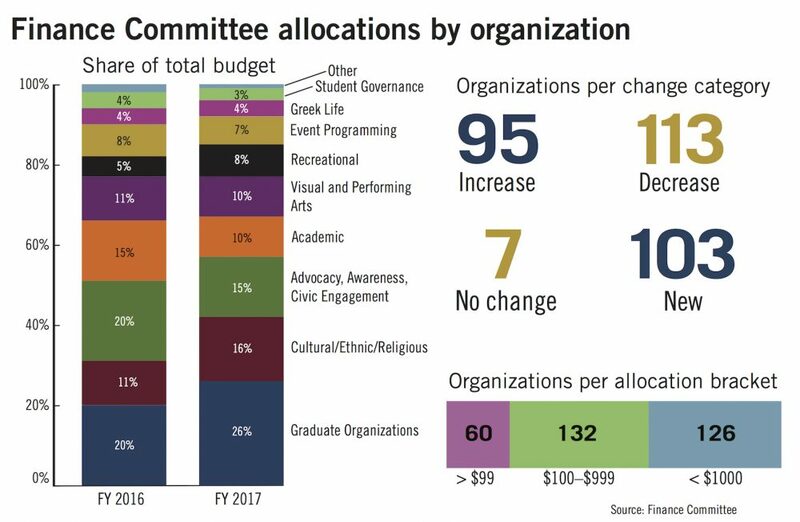 While these types of student groups earned a larger chunk of the SA’s roughly $1.3 million budget, other academic and advocacy groups got a smaller slice of that total after the SA made substantial changes to the way student organizations are awarded funding. The SA denied or cut funding for groups that requested items that could not be used for more than a year or that did not provide thorough descriptions of items in their proposed budgets, according to finance committee documents obtained by The Hatchet. The SA’s finance committee awarded over $100,000 less in initial allocations for next fiscal year than it did the year before: 113 student groups received less funding, according to documents posted on the SA’s website. The SA now has about $345,000 to dole out in co-sponsorships throughout the year – a significantly larger amount of money than in past years. Twenty-nine organizations in total were completely denied funding for next academic year. Paden Gallagher, the chair of the finance committee, said there wasn’t a “conscious effort” to give certain categories of student groups a greater share of the budget than others. He said rule changes that prioritize “cultural significance” helped multicultural organizations receive more funding. Even with the rule changes, the finance committee only granted 21 percent of requests for cultural or religious food. “Those changes unfortunately didn’t benefit other groups, such as academic, advocacy or arts groups, as much,” he said. For 14 of the 29 organizations that were denied funding, finance committee members commented that the organizations had requested funding for things that were “non-durable,” meaning they could only be used one time. The finance committee told 19 of the groups that they either didn’t provide “sufficient justification” or enough detail in their requests to merit funding. Allocations for 68 groups designated as cultural, ethnic or religious jumped by 37 percent from last year to more than $150,000. Those organizations make up 16 percent of the SA’s total budget for next fiscal year – 5 percent more than last year. The initial allocation for the Organization for Latino American Students, one of the largest multicultural organizations on campus, jumped from more than $12,000 last year to about $20,500 for next year – the ninth largest allocation given out by the SA. Graduate organization funding also increased because more graduate umbrella organizations “opted-in” for SA funding, which lets them receive more money during the allocation process. Some of the rule changes hurt academic and advocacy-themed organizations: Overall, the SA cut those groups’ funding by more than 35 percent. The finance committee gave out about $77,000 less this year to advocacy, awareness and civil engagement organizations, and about $62,000 less to academic or professional groups. SA president Andie Dowd said the budget process is more fair to student organizations, and she plans to sign it as is. Parker Griffin, the treasurer of the Delta Phi Epsilon foreign service fraternity, said his group’s initial $460 allocation was less than half of what it usually is. He said he met with a finance committee senator before allocations were announced who told him the budget would likely be approved. Even with the $1,000 the organization received on appeal, Griffin said it wouldn’t be enough to fund the internship panel – a program that features alumni and others in the industry offering job and internship advice. He said even though the finance committee has budgeted for more co-sponsorships, which are funded throughout the year, he and other members of his organization have “less control” over its events because the funding isn’t determined beforehand. “We don’t want to stake our reputation based on what the SA says,” Griffin said. Jessica Mandell, the treasurer of Psi Chi International Honor Society in Psychology, said the finance committee initially gave the organization no funding for next academic year. She said the finance committee’s reason for denying her group’s budget – that her request would only be good for one year – “made no sense at all” because they asked for funding for supplies that would be used for several years. She said the organization got all $187 it requested and received on appeal after she explained that the materials they requested would be used for several years.